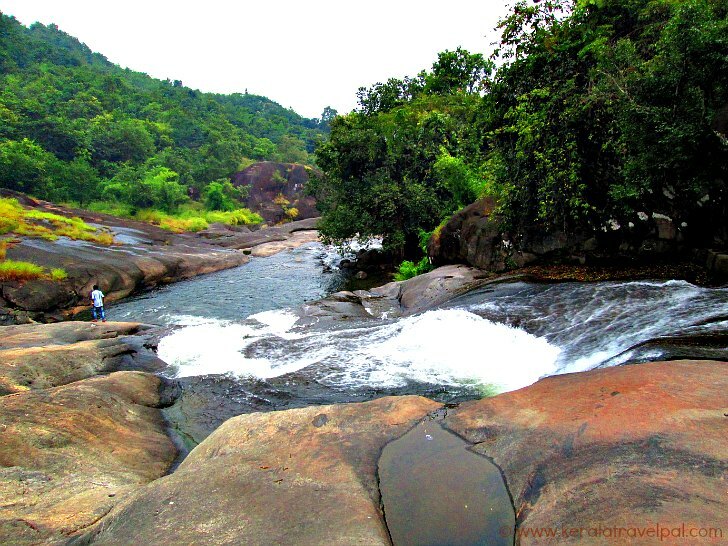 At Adyanpara, the speeding stream finds way through the ups, downs and contours of a black rocky terrain forcing multiple cascades that plummet around 300 feet. It is located in the outskirts of Nilambur town. The name of the waterfall village –Kurumbalangode -may not sound pleasing. The place is nevertheless very pleasing. Further from Nilambur, paddy fields, teak plantations, bamboo woods and evergreen forest take over the rich red soil of the uneven land. Exotic and migratory birds belonging to this bird haven flock everywhere from tree tops to grassy grounds. By resting on the rocks and flying over the stream they also become part of the waterfall experience. Forest of this region has its fair share of wild life. The waterfall area away from their habitat is generally considered safe. After coming into life at the nearby mountain peak, the stream meanders through the rain forest to the rocky basin. The perennial flow creates cascades all along the way; however most of them are too tiny to be taken seriously. Cascades created as it reaches Adyanpara fuse fury to beauty at a notable level. The swift stream that flow away past the cascades, in due course, gets morphed to the bigger and slower River Chaliyar. 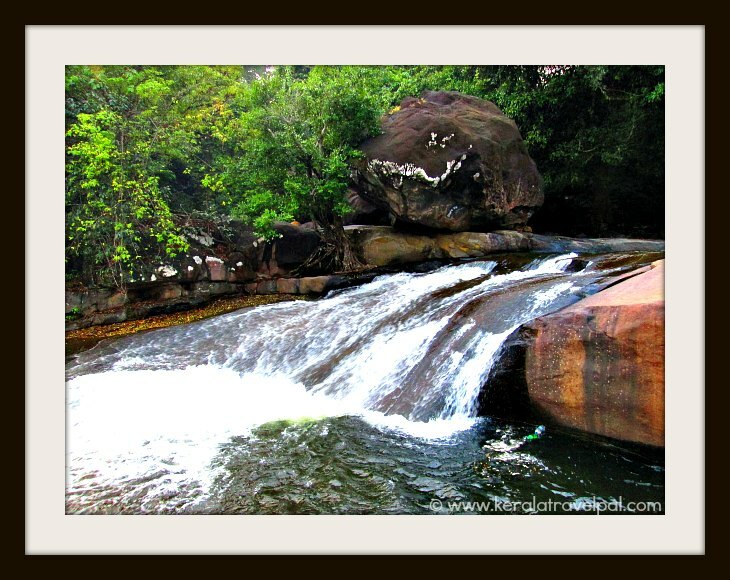 Similar to some other Kerala waterfalls such as Palaruvi, water of this falls is regarded as medicinal. Water gets too intimate with all kinds of herbs and shrubs from the jungle before reaching the falls. Unlike Palaruvi falls, people do not flock here to have medicinal bath. As we settle with the sights, the vista of the mid jungle and its rocky stream brings along an uplifting feel. During mid summer water almost dries up. Visitors arrive here even then because summer brings its own attractiveness. Still a local tourist spot, visitors, mostly locals, reach here to have a picnic in a picture perfect spot. Some youngsters with a streak of adventure even slide down along the water flow! The waterfall is located among hills at a higher altitude. So a bit of trekking is a necessary prelude. Hill climb is followed by walk through paths of slippery rocks. Adyanpara (also Adyanapara and Adyanappara) is a good place to be in, if visiting Nilambur is in your agenda. 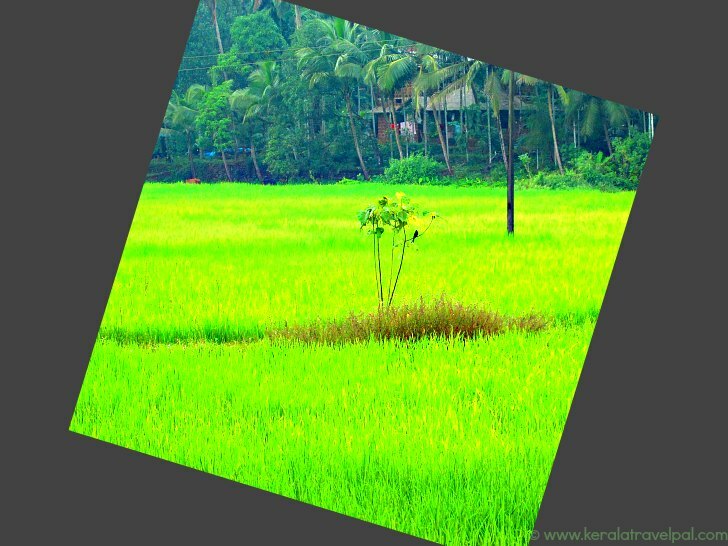 Nilambur, the land of Paddy fields and Teak plantations is a gateway town along the interstate highway. It is the last major town to fill up fuel and food during interstate travel from Kerala. Gudallur, the border town is too small in comparison. Nilambur holds world’s largest teak plantation. World’s first teak museum is just 4 kilometres away from town along the Gudallur Highway. Visitors to here get to know all aspects of teak, both as tree and timber. Be ready for a comprehensive teak experience! The waterfall never dries up and can be visited throughout the year. Many visit here year round, although the best time to visit is September till December. This Kerala waterfall is 10 Kilometers from Nilambur, close to Kozhikode to Ooty highway. Nilmbaur is 70 Kilometers from Kozhikode City. Nilambur has a railway station with services connecting to major cities in Kerala and nearby states. Nearest towns : Nilambur at 10 kms. Railway Station : Nilambur Railway Station at 10 Kms . Food Options : Take some food and drinks with you. No food available near the waterfall. Several restaurants are there in Nilambur town. Accommodation Options : Lodges and hotels at Nilambur town. Best time to visit : Immediately after monsoon i.e., from September onwards. Can be visited throughout the year. Beware of slippery conditions, especially during peak monsoons. Nearby Attractions : Conolly Plot, Teak Museum, Nedumkayam, Kadalundi bird sanctuary, The Elembalai hill, Banglavu Kunnu and Thirumandhamkunnu Temple.